I got lots of hair freebies in the mail today! 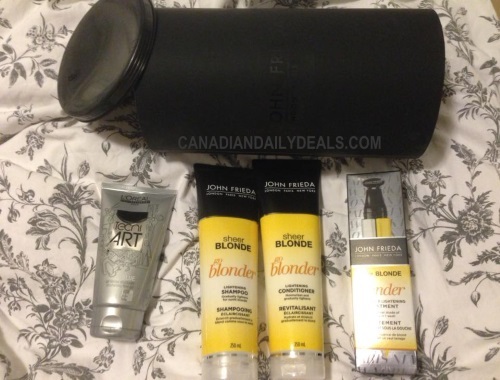 The John Frieda Sheer Blonde products came from a GlamSense campaign/Topbox that I blogged here. I just opened the email today that said that I got accepted into this campaign (after I got the shipment) so I had no idea that it was coming! The three products came enclosed in a black cylinder packaging, very nice. The products included a blonde lightening shampoo and conditioner, as well as a in-shower lightening treatment. The other products left of those is a Loreal Tecni Art texturizing fibre gel. This came from the Loreal Pro Instagram giveaway that that they had just recently that I blogged here. This came very quickly. What did you get in the mail? Let us know on our Facebook Page here!